Drue glances through the locker at his home plane of Narnia, and turns around. No, Capeside is his home now. And Jen is his Aslan. I’ve never read those books if that isn’t clear. The streak of 4th season threepeats continues! This week we are early in the season with a fun drunken party episode. It’s not Jen’s birthday, and that’s a cause for Celebration in Drue’s eyes (dreamy blue eyes). So he B&Es some fool’s summer home and throws a rager. Meanwhile Pacey and Joey are cutely bickering, and Joey takes the upper hand by slamming party punch til she can’t hear colors anymore. Dawson also shows up to the bash, for reason’s I can’t remember. And Andie & Jack make an appearance as well to blow off the college hunting blues. The result: Drue gets away with it, because he’s the best. 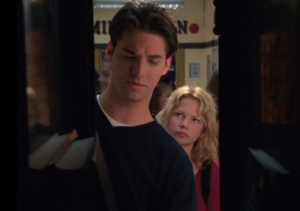 Joey bonds with the girls, and bonds with her boy, Dawson has a sad, and Jen gets the hookup on some sweet Ecstasy, setting up a future plot point. All-in-all, it’s a fun time. And it’s a threepeat, so you can bet there will be rambling as well.